Who said Rolls Royce or Maybach are the prestige? Check out Russian car build for Vladimir Putin the Russian President. 7.0 litre engine, 315 bhp. Not so good on the design as the project was very rushed but they will get there ;).Moscow Joint-Stock Company “The Likhachov Plant” AMO ZIL “Zavod imeni Likhachova”, more commonly called ZIL (Russian: Завод имени Лихачёва (ЗиЛ)—Likhachov Plant, literally “Plant named for Likhachov”) is a major Russian truck and heavy equipment manufacturer based in the City of Moscow, which also produced armored cars for most Soviet leaders, as well as buses, armored fighting vehicles, and aerosani. 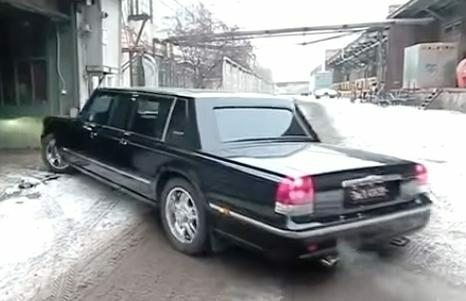 The company also produces hand-built limousines and high-end luxury sedans (автомобиль представительского класса, also translated as “luxury vehicle”) in extremely low quantities, primarily for the Russian government. ZIL passenger cars are priced at the equivalent of models from Maybach and Rolls-Royce, but are largely unknown outside the CIS and production rarely exceeds a dozen cars per year. The factory was founded in 1916 as Avtomobilnoe Moskovskoe Obshchestvo (AMO, Russian Автомобильное Московское Общество (АМО)—Moscow Automotive Society). The plans were to produce Fiat F-15 1.5 tonne trucks under licence. Because of the October Revolution and the subsequent Russian Civil War it took until 1 November 1924 to produce the first vehicle, the AMO-F-15. In 1931 the factory was re-equipped and expanded with the help of the American A.J. Brandt Co., changed its name to Automotive Factory No. 2 Zavod Imeni Stalina (ZIS or ZiS). After Nikita Khrushchev denounced the cult of personality of Joseph Stalin in 1956, the name was changed again to Zavod imeni Likhachova, after its former director Ivan Alekseevich Likhachov.